Around 70 miles north of Phoenix sits Arcosanti, a futuristic desert compound designed by Italian architect Paolo Soleri. 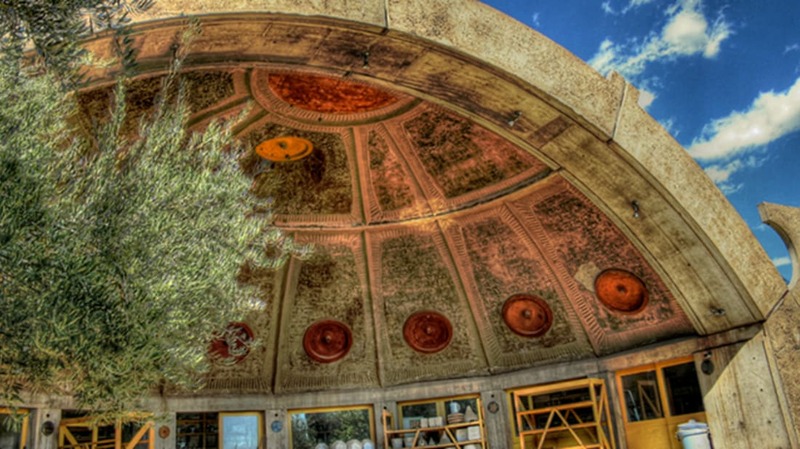 The former student of Frank Lloyd Wright, who died in 2013 at the age of 93, built Arcosanti based on a concept called arcology, a type of architecture that melds ecology with form. Soleri envisioned Arcosanti as a hyper-dense city, in which its projected future population of 5000 lived, farmed, and socialized in large communal spaces. He believed that this type of urban layout would promote sustainability, reduce waste, and foster relationships. Arcosanti was never officially completed, but it still attracts tourists, artists, and a handful of permanent residents who continue to build towards Soleri’s dream. Take a virtual tour of Arcosanti, and learn about the compound’s plans for the future, by watching The Atlantic’s video below.